Today I had time to mill out the new Noux-2 deck plugs from MDF. The deck is designed starting from the angle of a typical no1 rig jib-boom. After thatÂ I just drewÂ curve to please the eye, and to give stiffness to the laminate. To make fitting the deck easier the join between hull and deck is 90 degrees everywhere. The plugs include extra areas on the side (white) so that a bigger laminate can be made and then cut to final shape. The aft-deck design. Here I have made sure that the cockpit floor slopes aftward so that any water that is taken in drains out. 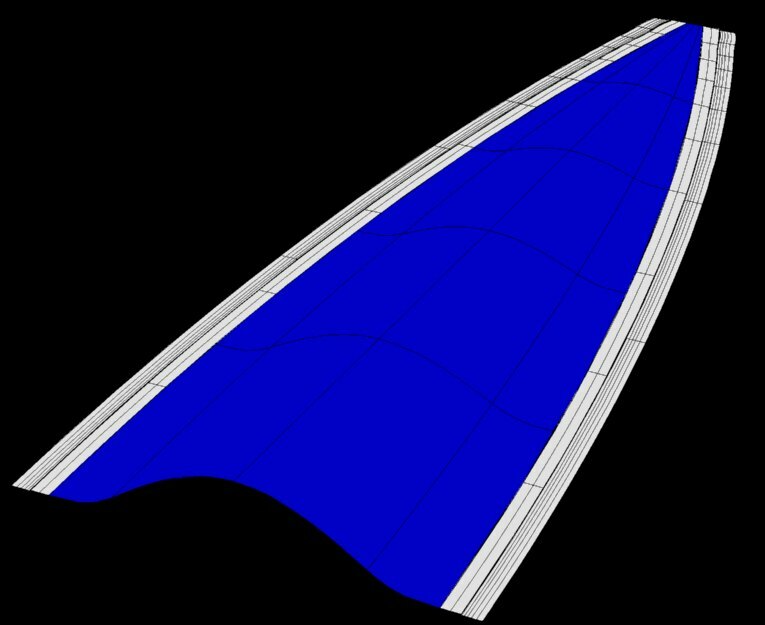 The overall shape follows that of the stern and wides forward. 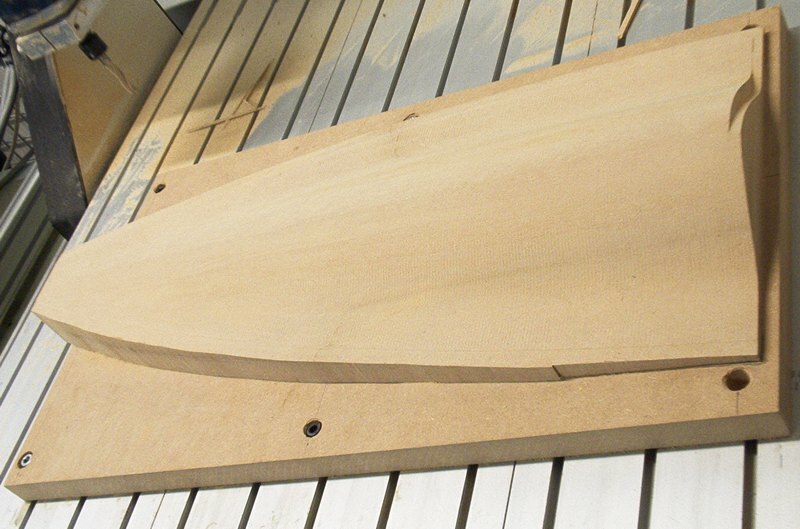 The aft-deck laminate will include a 10-20mm flange which forms a gluing area to the foredeck. Aft deck rough pass is done and we are about halfway through the finish pass. While rough-milling I need to keep the vacuum cleaner very close to the mill at all times to avoid a total mess in the workshop. The finish-milling removes only about 2mm of material and I can get a way with vacuuming every 15min or so. I'm using EMC2 to drive the stepper-electronics of the router. I find this very interesting. 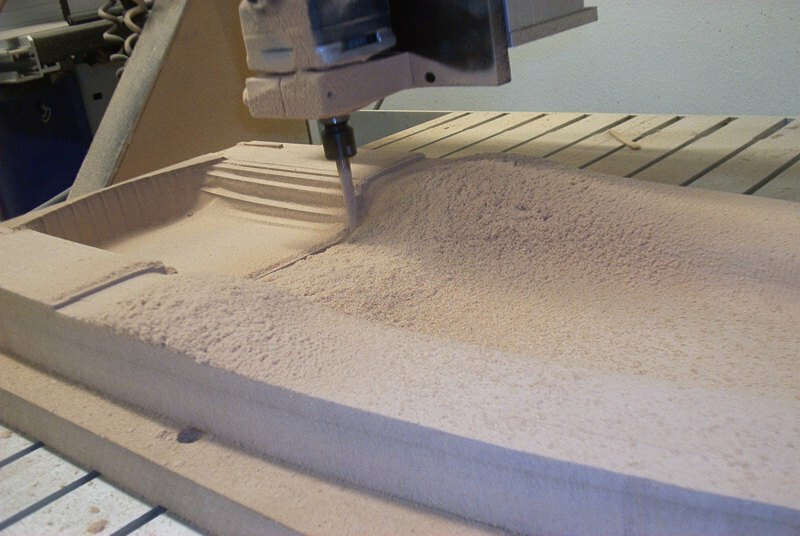 I have access to a 5 axis router at work and have machined some mdf moulds with it. I have problems with the dust and notice that you are using toothed cutters - can these run slower and oproduce less dust than normal fluted cutters. The other thing that happens is that surfaces are different inthe area of glue lines. I guess the mdg is harder on its surfaces than in its core. Do you have the same issue? 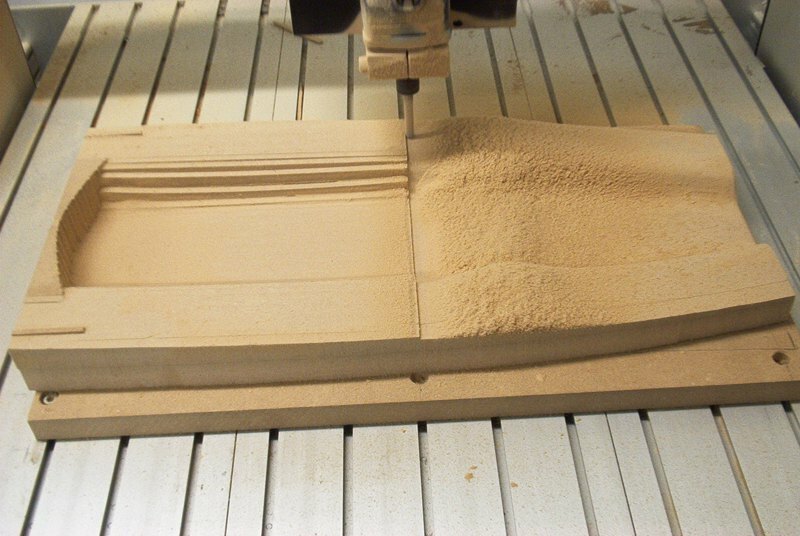 Hi Ken, nice to hear from you, I've never used or programmed a 5-axis router - must be a real challenge. The toothed cutter was recommended to me by the place which sells cutters. It is a roughing cutter for wood. There are similar toothed cutters for metal, also meant for roughing. I understand the tooths make the cutter run cooler and makes it easier to remove large volumes of material. The downside is that the finish when cutting with the side of the cutter is not that great - however that was no problem for this project as there are no vertical surfaces. I use a spindle from a hand-held router. It's rated at 700W and spins at 10 - 30 krpm. I use it at close to max rpm. I don't think the toothed cutter makes very much of a differens with the dust, as described above I use a vacuum cleaner during the whole rough-mill pass. Another person(Australian) I spoke to about making plugs/moulds out of MDF described the same thing as you do: harder edges of the MDF board. I have not had this problem, maybe the MDF sold in Australia or UK is different from the one sold here in Finland. If you look at the 4th picture above you see the bare MDF board used as a support under the foredeck plug. That is the way the surface of the board looks when I buy it, no special surface treatment or anything. I have used water-soluble wood glue (white) to glue the boards together to achieve enough thickness. The glue I use is from Kiilto (www.kiilto.fi) but you can probably find water soluble white wood glue locally under some other brand. I am sorry it has taken me so long to reply and thank you for your valuable advice. 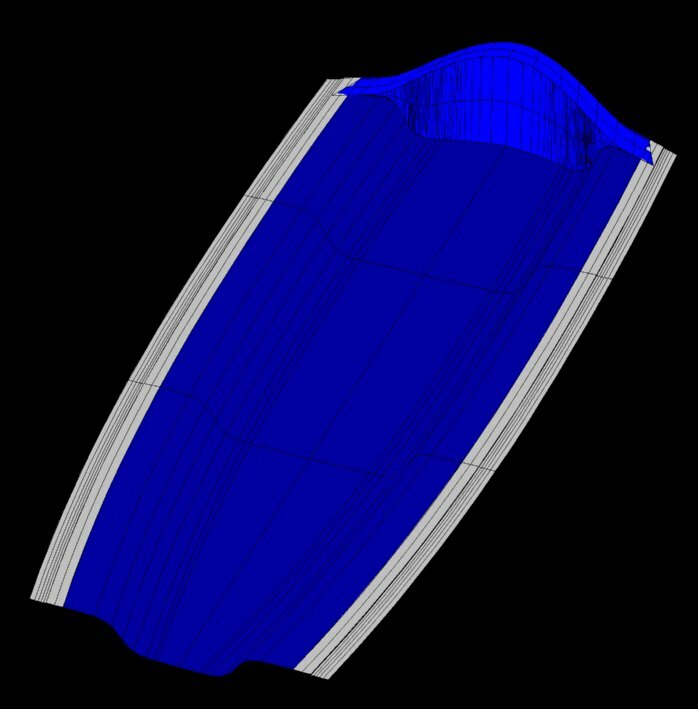 We use software to generate the toolpaths on our 3D models, so most of it is procedure, but working in 5 axis produces strange results sometimes, and is still produces unpredicatable head movements. I try to stay in 3 axis if at all possible! Thanks for advice on tools, I'll try one like yours and see if things are any different. I tend to use ball ended solid carbide cutters. I would like to try to Milling The hull and deck. have you got a copy of the files you used. As I'm new at cnc milling. What software are you using . it has both the shape of the deck and the hull. 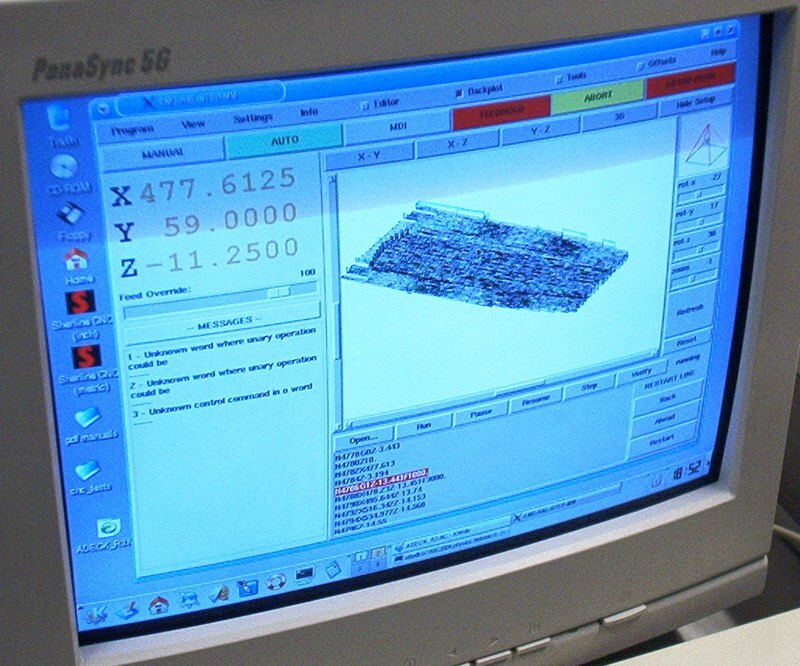 If you have a mill large enough to cnc cut a mould you probably also have a CAM program which can create the neccessary G-code from the IGES file.